In honour of Women’s History Month, throughout March the RBBM Facebook and Twitter have shared poems linked to influential women in Robert Burns’s life. We thought we’d round off the month with a blog exploring each of these ladies in more detail! First up is Jean Armour, Robert’s wife. 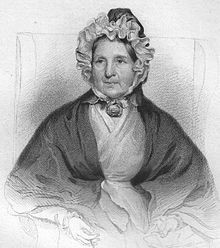 She was born 25th February 1765 in Mauchline, Ayrshire. Whilst growing up, Jean was renowned for her beauty and was part of a group of young women often referred to as ‘the Belles of Mauchline’. She met Robert when she was around eighteen, and less than two years later she was pregnant with his child – her father famously fainted when told that Robert was the father! He refused to allow the couple to marry – this meant he would rather Jean be a single mother than married to Robert, which speaks volumes about Robert’s reputation! Despite this less than promising start to their relationship, Jean and Robert were formally married on 5th August 1788 – Jean’s father had come round to the idea after Robert’s poetry success. They had a mostly happy marriage, despite Robert’s famous infidelities – Jean herself said that he should have had ‘twa wives’. Jean and her family moved to Dumfries in 1791 and this is where Robert died in 1796. Jean could not attend his funeral as she was in labour with their ninth child, Maxwell. Tragically, Maxwell died at the age of two – just four of the couple’s children survived to adulthood. However, Jean did also look after Betty Park (Robert’s child to Ann Park) and they had a good relationship. 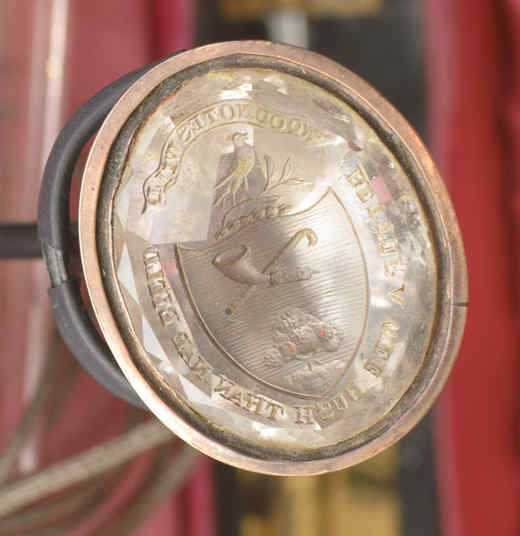 After Robert’s death, Jean never remarried, and she lived in the house they had shared in Dumfries until she died 26th March 1834 – she outlived her husband by thirty-eight years. Next is Agnes Burnes, née Broun – the Bard’s mother. Agnes was born 17th March 1732 near Kirkoswald in Ayrshire. Her mother died when she was just ten years old; being the eldest sibling, it was then Agnes’s responsibility to care for the family until her father remarried two years later. However, Agnes and her new step-mother did not get on well, and Agnes was sent to live with her maternal grandmother in Maybole. She instilled in Agnes a great love for Scottish folk song and music. Agnes met William Burnes (spelled differently but pronounced the same as ‘Burns’) in 1756 and they married on 3rd December 1757. They settled in the clay biggin William had built in Alloway; Robert Burns was the eldest of their seven children. It is thought that Agnes was a great influence on Robert’s own love of Scottish folk song and music, just as her grandmother had been to her. After William died in 1784, Agnes went to live with her son Gilbert. She moved around with his family until her death, at the age of eighty-seven, on 14th January 1820. The third woman we featured this month is Frances Dunlop, a wealthy heiress almost thirty years older than Burns. Born 16th April 1730, her maiden name was Wallace, and her family claimed descent from William Wallace himself! Frances married at eighteen, when her husband, John Dunlop, was in his forties. They had a happy life together – however, John died in 1785. In the same year, Frances’s childhood home and lands were lost to the family. These incidents caused her humongous grief and she fell into a prolonged depression. 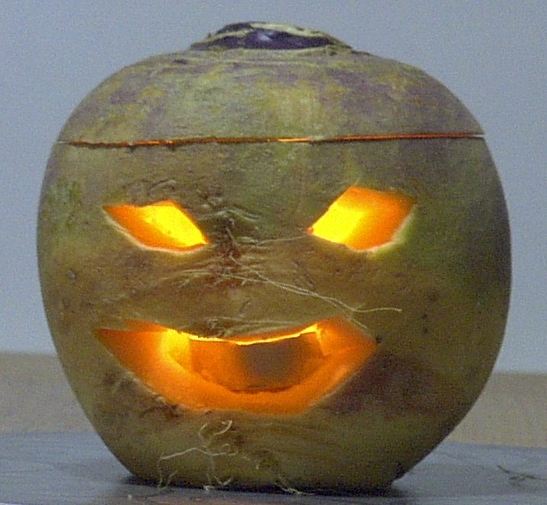 What finally roused her was Robert Burns’s poem ‘The Cotter’s Saturday Night’. She enjoyed reading it so much that she contacted Robert to ask for more copies and to invite him to her home – this began a long and friendly correspondence that lasted until the end of Robert’s life. Frances treated him almost like another son, praising his achievements and admonishing his indiscretions. She even offered advice on drafts of poetry and songs he would send her, the most famous of these being ‘Auld Lang Syne’! 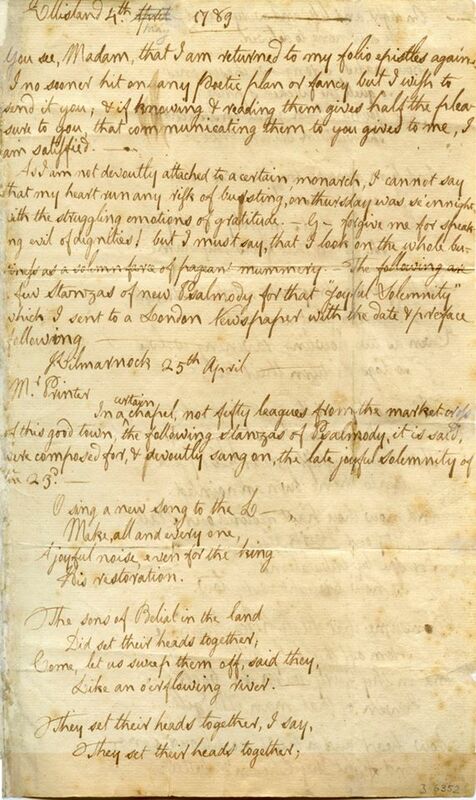 Although there was a two-year gap in their correspondence after Burns had offended Frances with some comments she deemed radical, Frances sent him a reconciliatory letter mere days before Robert’s death. She outlived him by nearly twenty years, dying 24th May 1815. The last woman featured is Agnes Maclehose, aka the ‘Clarinda’ to Burns’s ‘Sylvander’. Agnes was born 26th April 1758 in Glasgow. She grew up to be a very articulate, well-educated and beautiful woman. She married at eighteen, but the marriage was an unhappy one and she separated from her husband in 1780. Agnes met Robert Burns several years later at a party in Edinburgh – they were immediately taken with each other, and she wrote to him to invite him to tea at her home. Although an accident prevented this from happening, there began a long series of love letters and love poetry sent between the two. They used the pseudonyms ‘Clarinda’ and ‘Sylvander’. Despite the intensity of their correspondence, it is widely-thought that their affair was unconsummated. As Agnes was an incredibly pious woman and, although separated, still married, this makes sense. In 1791 Agnes sailed for Jamaica to attempt to reconcile with her husband – however, he had started a family with another woman, so she returned to Scotland after only a few months. She met Robert for the last time in December of that year. For the rest of her life Agnes took great care of her letters from Robert, and after his death she even negotiated to have the letters she had sent to him returned to her. In 1821 Agnes had tea with Jean Armour in Edinburgh. The two women, who could have been viewed as rivals of sorts, got on well and talked at length about their families, as well as their shared regard for Robert Burns. Agnes died twenty years later, at the age of eighty-three, on 23rd October 1841. You can find the original Facebook and Twitter posts at https://www.facebook.com/RobertBurnsBirthplaceMuseum/ and https://twitter.com/RobertBurnsNTS. This entry was posted in feminism, poetry, Robert Burns, women's history, Writing and tagged 18th century, Agnes Broun, Agnes MacLehose, feminism, Frances Dunlop, history, Inspiration, Jean Armour, literature, poetry, Women, Writing. 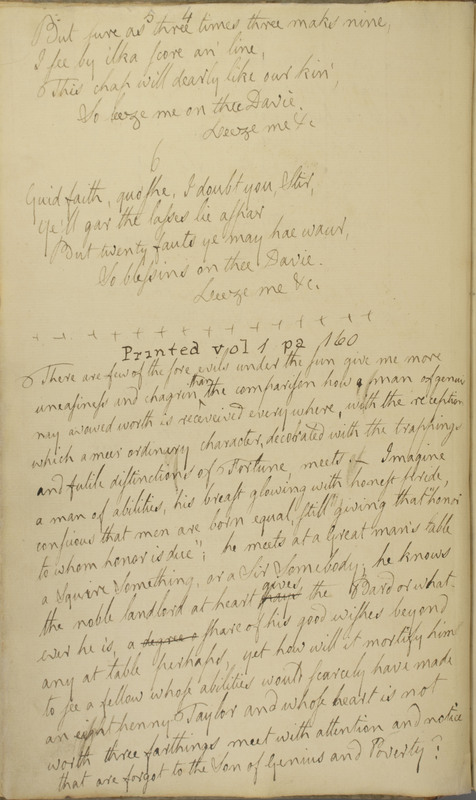 As it’s Women’s History Month, one of the Learning Trainees here at RBBM, Caitlin Walker, has written about the attitudes to women found in Burns’s poetry. She has written the post in a similar way to how she would speak it, which is why there is a mixture of Scots and English language. Maist folk know that Robert Burns enjoyed the company of women – his famous love affairs, the hundreds of poems and songs they inspired and the thirteen (that we know of!) weans he fathered attest to that. But what did he actually think of women? Burns was born and lived his life during the latter half of the eighteenth century, a time when women couldnae vote and were rarely, if ever, formally educatit. Gender roles were strictly prescribed – for instance, women of the working class were given no formal education but taught how to run a hoose and look after a faimlie. Tasks were divided by gender completely, to the extent that women milked the coos but men mucked oot the byre, and during harvest time men used the scythe while women used the heuk. Women of higher classes would have learned literacy and maybe even another language or a musical instrument, but the expectation was the same – get merrit and raise a faimlie. 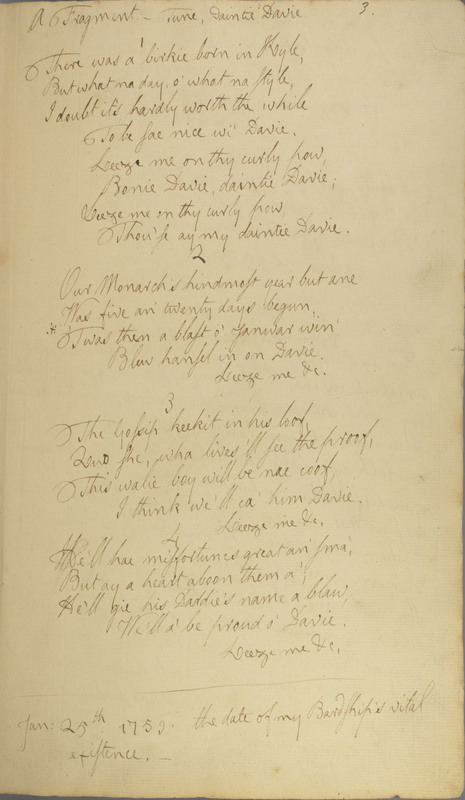 Different poems by Burns depict varying attitudes to women. For instance, ‘Willie Wastle’ – which is perhaps an unsuitably-named poem as it’s really about Willie Wastle’s wife – is hardly complimentary towards women. Burns describes her using terms such as ‘dour’, ‘din’, ‘bow-hough’d’ and ‘hem-shin’d’. She allegedly has ‘but ane’ e’e, ‘five rusty teeth, forbye a stump’, ‘a whiskin beard’ and ‘walie nieves like midden-creels’. Burns rounds off every stanza with the line, ‘I wad na gie a button for her’. This Burns is a far cry from the adorer of women the world recognises – he is being extremely disrespectful and takin nae prisoners in mocking her appearance! This photograph shows the sign for the Willie Wastle Inn in Crosshill, Ayrshire. It depicts Willie’s wife as she is described in the poem. Contrast this with ‘The Rights of Woman’, Burns’s call for folk to remember the rights of women amongst the turbulent atmosphere of the eighteenth century, when ‘even children lisp the Rights of Man’. At first glance this seems like Burns being exceptionally forward-thinking for the 1700s – however, the ‘rights’ in question are: the right to protection, the right to decorum and the right to admiration. So really, Burns’s progressive rally for the rights of women is patronising and objectifying, which is a step up from outright insulting maybe, but still no brilliant. This is a copy of ‘The Rights of Woman’ written by Burns in 1793 and sent to Mrs Graham of Fintry. Then we have ‘It’s na, Jean, thy bonie face’ – and thank goodness! This poem is an outpouring of Burns’s love for his wife, Jean Armour – but crucially, it is ‘na her bonie face’ that he admires, ‘altho’ [her] beauty and [her] grace/ Might weel awauk desire’. Instead, it is her mind he loves. This shows Burns’s respect for Jean as a person with her own thoughts and desires. He goes on to say that even if he was not the one to make her happy, that someone would and that she’d be ‘blest’. He even says that he would die for her: this selfless desire to see her happy chimes much more with the image of Burns as the great lover of women that the world knows. 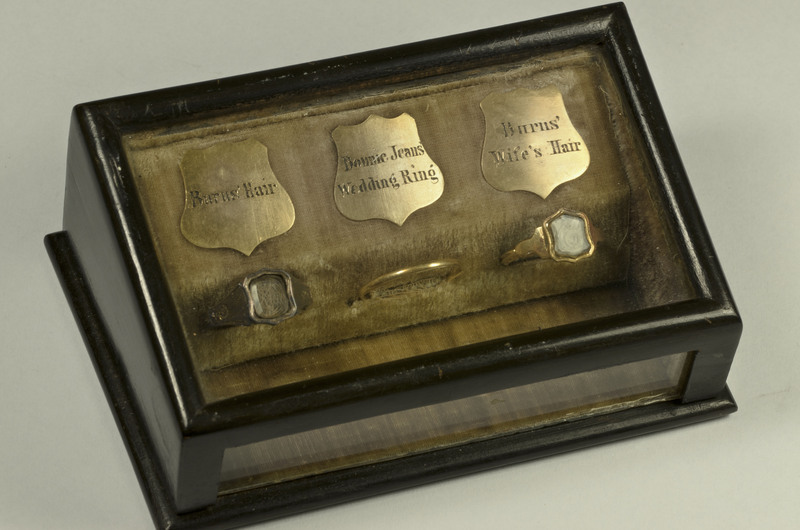 This photograph shows a case containing Jean’s wedding ring, as well as a ring containing a lock of her hair and a ring containing a lock of Burns’s. Of course, cynics may just read ‘It’s na, Jean…’ as a soppy, hyperbolic gesture to get back in Jean’s good books – ye can make up yer ain mind. This entry was posted in feminism, poetry, Robert Burns, women's history, Writing and tagged 18th century, feminism, history, Jean Armour, literature, poetry, rights of women, Robert Burns, Scots language, willie wastle, Women, Writing. On the BBC’s website it is listed that there are 118 poems written by our beloved bard Robert Burns with the theme of nature, however, I would argue that there is so many more as nature – a subject which was very close to his heart – is inextricably intertwined in a number of his works. The reason nature is a genre featured so heavily within Burns’s works can be traced back to his upbringing and lifestyle. Being born in the but-and-ben Burns Cottage in Alloway, he was introduced to the ways of farmlife from childhood. He worked with his family closely there and at multiple farms thereafter such as Mount Oliphant and Lochlea Farm. Burns and his brother Gilbert even farmed at Mossgiel Farm when his father died. He did not just have connections with the land in his younger years but as an adult as well as he worked as a farmer alongside his career as a poet and songwriter. His last farming endevaour was at Ellisland Farm in Dumfrieshire. His rural upbringing and argicultural employment earned him his nickname as “The Ploughman Poet” by the artistocratic society of Edinburgh. Burns lived in Edinburgh for only two years – the city which he described as “noise and nonsense” – to return to his rural roots. Firstly, I would ask: what is nature? It is defined as the phenomena of the physical world collectively, including plants, animals and the landscape. Burns did not neglect any of these three aspects and used them frequently as the inspiration of his works. He did various works which refer to plants such as To a Mountain Daisy, My Luve is Like a Red Red Rose and The Rosebud. Some of my personal favourite works of Burns which talk about other environmental features include Sweet Afton (about a river) and My Heart’s in the Highlands (which of course is about one of the most rugged, scenic and breath-taking landscapes in the world). However, what this blog will mainly focus on is that Burns was most notably an animal lover. This is conveyed in his works On Glenriddell’s Fox Breaking his Chain, The Wounded Hare, Address to a Woodlark, The Twa Dogs, To a Louse and the renowned and much adored To a Mouse. This last poem – which was written in 1786 and published in the Kilmarnock Edition – is a perfect example of Burns’s humanity as this poem reflects his concern for animal welfare, his consciousness of humankind’s effect on nature and has empathy for a small creature which is widely considered as “vermin”. This was very ahead of his time and is a concern that is currently proving to be a huge issue as more and more animals become extinct because of human’s destructive actions in the twenty-first century. 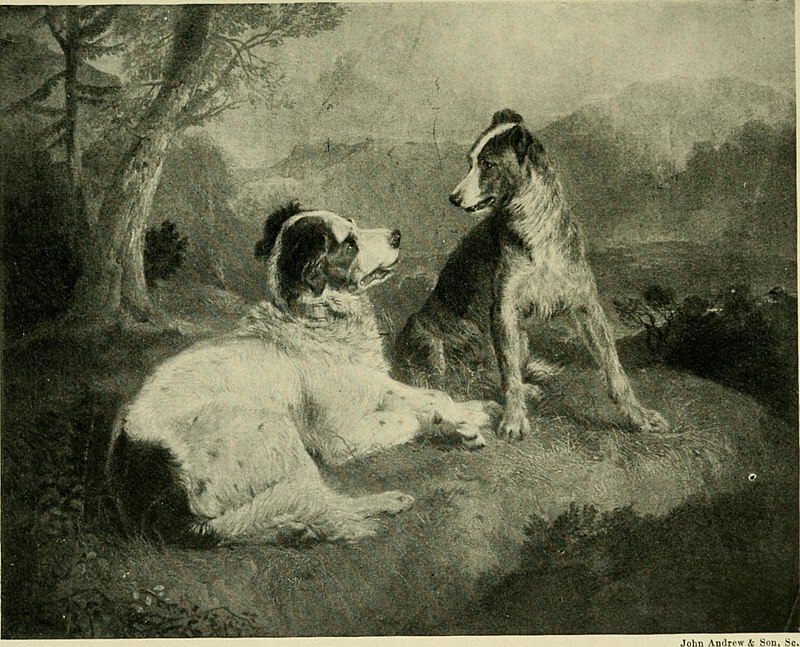 The Twa Dogs poem, written in 1796, is another great work of Burns’s which gives the two dogs human-like intellect and the ability to express themselves as it has an upper-class pedigree, Caesar, and an ordinary working collie, Luath, who chat about the differing lives of the social classes. The name “Luath” comes from Ossian’s epic poem Fingal. The Twa Dogs immortalizes Burns’s own dog Luath who came to a cruel end. On the morning of 13th February 1784 Robert and his sister Isabella were distressed to find the poisoned body of Robert’s dog Luath outside their door – the act of a vengeful neighbour. Arguably, Burns intended this poem as a memorial to his canine friend. The word choice makes the moral message of this poem is clear: Burns is vehemently opposed to shooting. The passion and intensity of Burns’s thoughts on this is quite surprising as one would think that as a farmer he would be used to or even dependent on killing animals, however, meat consumption was not as prominent in the eighteenth century as farm animals were only killed for food in old age or special occasions. The family’s provision of milk, cheese, butter and wool came directly from their own animals, and the health and wellbeing of these creatures were paramount. Furthermore they would share the same roof over their heads with them, thus creating strong bonds with their farm animals, and apparently Burns lost his temper with a farm-worked once when the man did not cut the potatoes small enough and Burns was frantic that the beasts might choke on them. A native denizen of Nature? That ne’er did harm to thine or thee? Again, you can clearly see that Burns is opposed to the cruel treatment of a “free-born creature” and is in disbelief of the actions of the good-hearted Glenriddell’s actions. Burns is saying that nature’s beauty is wistful, forever-changing and is out of the control of humankind as he insightfully states “nae man can tether time or tide”. In terms of this poem, another point is worth mentioning: the hero of this tale is a horse. Again Burns’s admiration and respect for animals is encompassed in the heroism of Meg, Tam’s horse, who against all odds does get him home in one piece although the same cannot be said for her. Burns was a brilliant horse-rider and would have relied heavily on his four-legged companion as a mode of transportation to socialise, to plough fields and to work as an excise man. All in all Burns would have been regarded nowadays as an advocate for animal welfare and his works which have animals or nature at their core reflect his love for nature and are some of his most passionate, most thought-provoking and most heart-rending. This entry was posted in nature, poetry, Robert Burns and tagged 18th century, Alloway, Ayr, Ayrshire, edinburgh, Gilbert Burns, history, learning, literature, museum, National Trust for Scotland, nature, poetry, research, Robert Burns, Scotland, Scots, Scots language, Tam O' Shanter.